Meetings have taken place between Tory and Labor politicians to find a proposal for the Commons before and emergency EU summit next week. But Sir Keir said the government was not "counting any change" on the wording of the existing plan. He said it was "disappointing", adding: "Compromise requires change." 2 and, as yet, no withdrawal deal has been approved by MPs. Theresa May has written to European Council President Donald Tusk to request an extension to June 30. 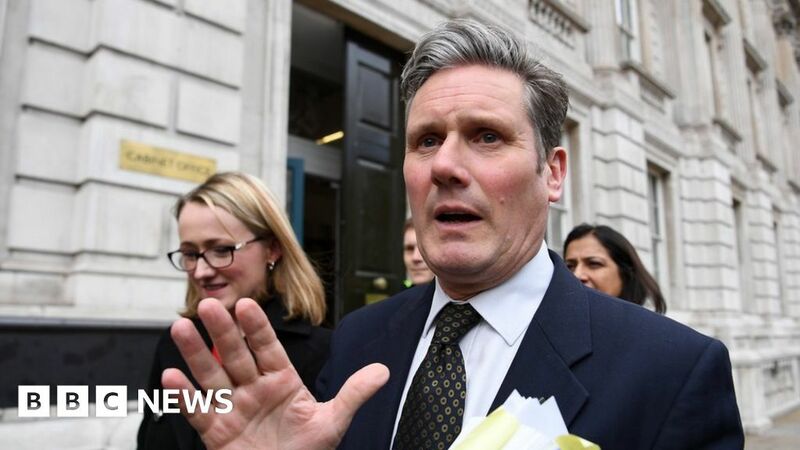 But she says if the Commons agrees a deal in time, the UK should be able to leave before European parliamentary elections on May 23. Sir Keir said: "We want the talks to continue and we've been in those terms to the government, but we need change if we're going to compromise." Prisons Minister Rory Stewart told BBC Radio 4's PM program that there were "but there was" quite a lot of life "left in the talks with Labor. He said:" In truth the positions of the two parties are very, very close and where there goodwill it should be possible to get this done and get it done quickly quickly. " He insisted that" of course w are prepared to compromise on the political declaration. BBC political editor Laura Kuenssberg said: "The sense is that the government has only offered clarifications on what might be possible from the existing documents, rather than adjusting any of their actual proposals in the two documents." that both sides agree with the talk, but there are no firm commitments for further discussions might take place. It comes as the prime minister is seeking a further extension to the Brexit deadline from the EU, leaving date until June 30. She said the UK would prepare to field candidates in European Parliamentary elections on 23 May in case no agreement was reached by then. The BBC's Europe editor Katya Adler has been told by a senior EU Source that European Council President Donald Tusk will propose a 12-month "flexible" extension to Brexit, with the option of cutting it short if the UK Parliament ratifies a deal. But French President Emmanuel Macron " s office said on Friday that it was "premature" to consider another delay.